Everyone remembers the 71st Academy Awards, held in 1999 to honor what were supposedly the best films of 1998. Saving Private Ryan was expected to win, but a slight, shallow period piece/romantic comedy called Shakespeare in Love pulled off an upset. Cynics alleged Miramax, the film’s distributor, dug deep in their pockets for a big-budget promotional campaign that assured its win. Is it a fondly remembered film? Probably by some, but generally speaking Shakespeare was a featherweight chick flick that can’t possibly figure too high on many people’s favorite movies list. What should’ve won? Probably any of the nominees except Shakespeare in Love (and Roberto Benigni’s tasteless Holocaust comedy Life is Beautiful). I’m not a particular fan of Saving Private Ryan, but my point is not that Ryan should’ve won, but that Shakespeare shouldn’t have. There were numerous films in 1998 that deserved recognition in the form of a Best Picture nomination (and were more deserving of the actual award, as well). Warren Beatty’s audacious, hilarious, bold Bulworth got buried by Fox for some reason (see Peter Bart’s The Gross for an in-depth examination of the summer of ’98 box office). While not a perfect movie, it at least had something to say about politics in America. It presented some interesting ideas, carried by a whopper of a performance by Beatty as the suicidal senator (he was nominated for Best Original Screenplay, at the very least). There was also the scathing ensemble piece Your Friends & Neightbors, written and directed by Neil LaBute. This was a difficult, probing examination of psychological mistreatment among a group of romantically-linked individuals. Infinitely more challenging and confrontational than Shakespeare, with a chilling performance by Jason Patric. But my choice for the most overlooked film of 1998: Spike Lee’s He Got Game, not only one of the greatest sports dramas of all time, but also a first-rate father-son drama. Lee celebrates the sport of basketball by creating something of an ambiguously surreal fantasy (the boldly creative ending puzzled some, but moved others). Watch closely near the very end for a visual reference to Wim Wenders’ Wings of Desire, a dead giveaway that Lee didn’t intend for everything in this film to be taken literally. Denzel Washington as Jake Shuttlesworth creates what is simply he least appreciated performance of his career. Lee also manages to get one of the best performances from an athlete/non-actor in Ray Allen as Jake’s son, the college basketball phenom Jesus. 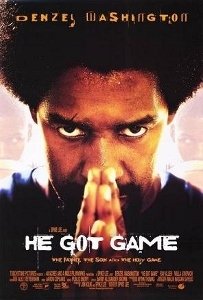 Complex, thought-provoking, and very deeply felt (not to mention featuring the breakout performance of Rosario Dawson and a great hip hop song-score by Public Enemy), He Got Game was one of the very best films of 1998. Sadly, the Academy has never been kind to Spike Lee (an admittedly polarizing filmmaker if there ever was one) and the film never stood a chance for serious consideration.